With the SparkFun Edge Development Board, edge computing is here! You've probably heard of this latest entry to the long lineage of tech buzzwords like "IoT," "LoRa," and "cloud" before it, but what is the edge and why does it matter? The cloud is impressively powerful but all-the-time connections require power and connectivity that may not be available. Edge computing handles discrete tasks such as determining if someone said 'start washer' and responding accordingly. The audio analysis is done at the "edge" rather than on the web. This dramatically reduces costs and complexity while limiting potential data privacy leaks. So now that you've embarked upon the journey to the Edge, let's take a moment to get off on the right foot. In this hookup guide we will get familiar with the hardware available and how to connect to your computer, then we'll point you in the right direction to begin writing awesome applications using machine learning! 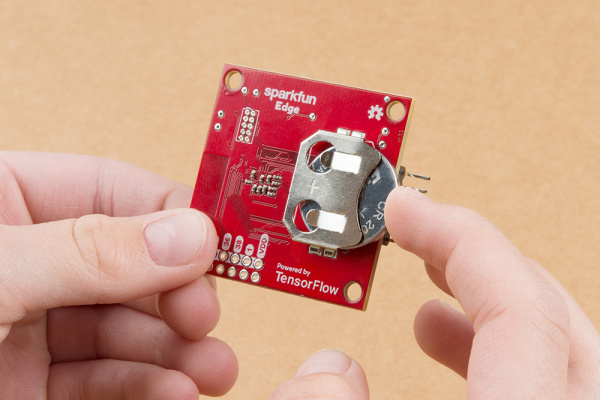 We will demonstrate how to get started with your SparkFun Edge Board by setting up the toolchain on your computer, examining an example program, and using the serial uploader tool to flash the chip. The Edge board uses the cutting-edge of high efficiency microcontrollers -- the Ambiq Apollo3 Blue. This small BGA package packs quite a punch! 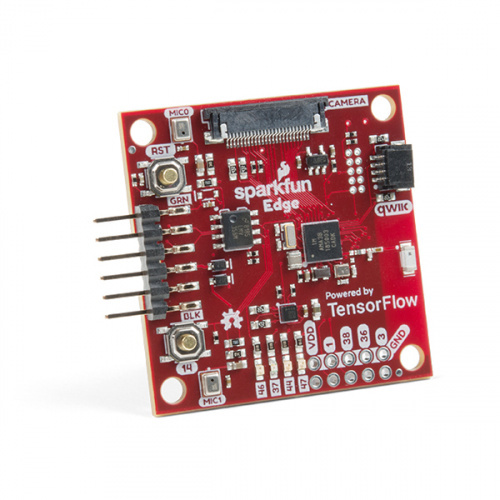 Such a formidable microcontroller would be wasted without a suite of cool sensors to use with it - that's why we've included two microphones, a 3-axis accelerometer, and a camera connector. Two onboard Micro Electro-Mechanical microphones come hooked up to an operational amplifier with 75x gain to make the best use of the Apollo3's built-in 14-bit analog to digital converter. Better yet the Apollo3 can use Direct Memory Access to take audio recordings without using processor cycles - that means you can process audio while you record the next sample! Dynamic interaction with the Edge is included right out of the gate with the onboard ST Microelectronics LIS2DH12 3-axis accelerometer. 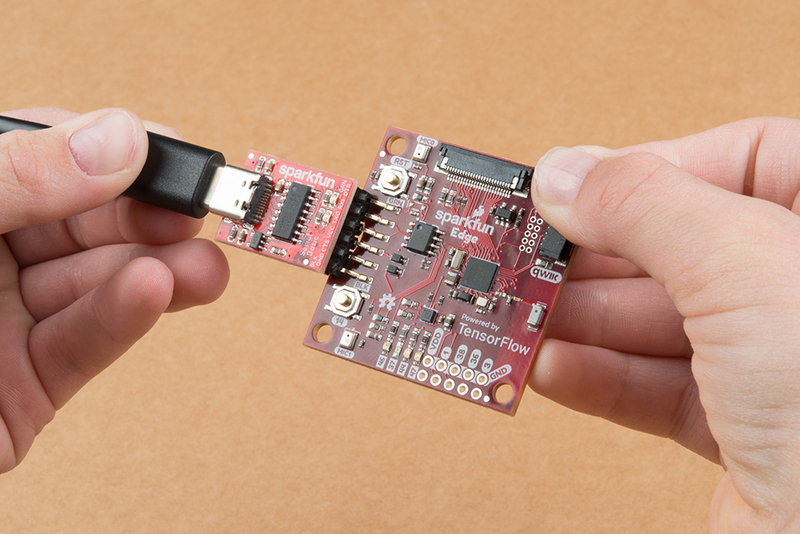 The accelerometer is on its very own dedicated I2C bus so there's no need to worry about address conflicts. At the top of the board we've included a camera connector. We've included this for use in ongoing development - preliminary stages are looking good and we hope to have this fully functional in very short order. 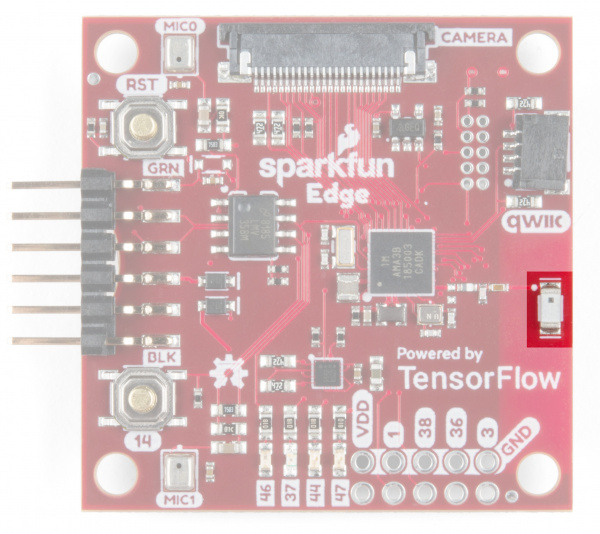 If you need anything else to complete your application there are plenty of ways to connect to the Edge board. Among these are the FTDI UART header, a Qwiic connector, a built-in Bluetooth radio, four GPIO pins, four LEDs, and last (but not least) a CR2032 coin cell holder. You'll use this connector to program the Edge board, but after that you can also use it to talk to other systems that use a UART interface such as GPS or Serial LCD. What's a modern answer to the age-old question 'SPI vs I2C?' Ambiq's answer is 'why not both!' so they've provided 6 'IOMaster' peripherals that can each be configured as either SPI or I2C. 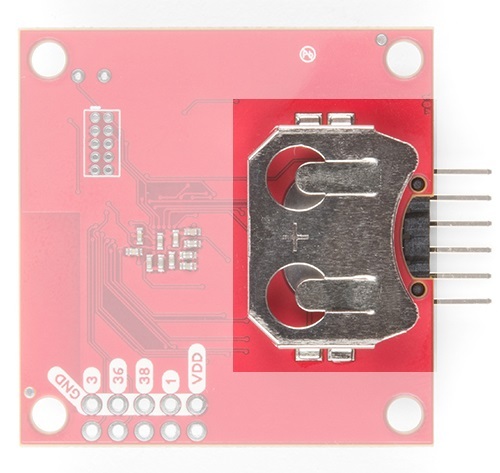 We've taken advantage of that fact on the Edge by exposing a fresh I2C port through a Qwiic connector, allowing you to add a chain of I2C sensors without soldering. The Apollo3 comes with hardware support for a Bluetooth Low-Energy (BLE) radio, and the Edge board pairs that up with a surface mount antenna. The BLE controller and host can be configured to support up to eight simultaneous connections -- security and extended packet length are also supported. If all that wasn't enough there were still more pins available on the Apollo3, so we broke them out to four LEDs and four GPIO connections along the bottom edge. These are good for addition additional simple input or output capabilities to a project. To demonstrate just how efficient this microcontroller is we included a coin cell battery holder on the bottom. That means that once your application is all ready you can take it to school on a key-chain and show it off to your best friend! To power the board either place a charged CR2031 3V battery into the coin cell holder or plug in your USB-serial converter. 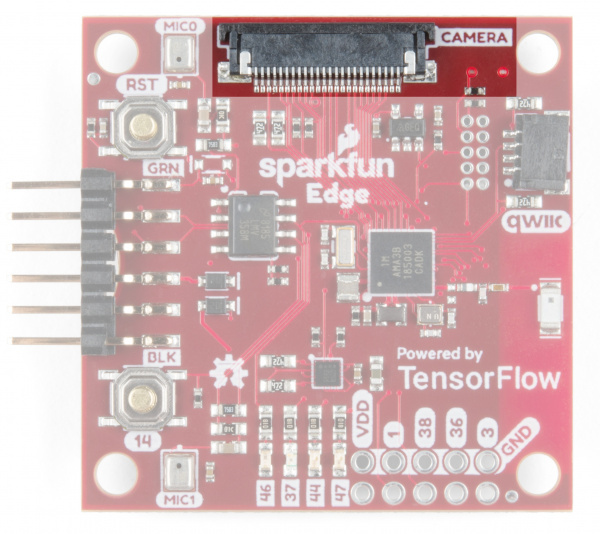 If you want to upload new code or see what the Edge board has to say to you then you'll need to be able to read the UART pins which are broken out just above the coin cell holder. 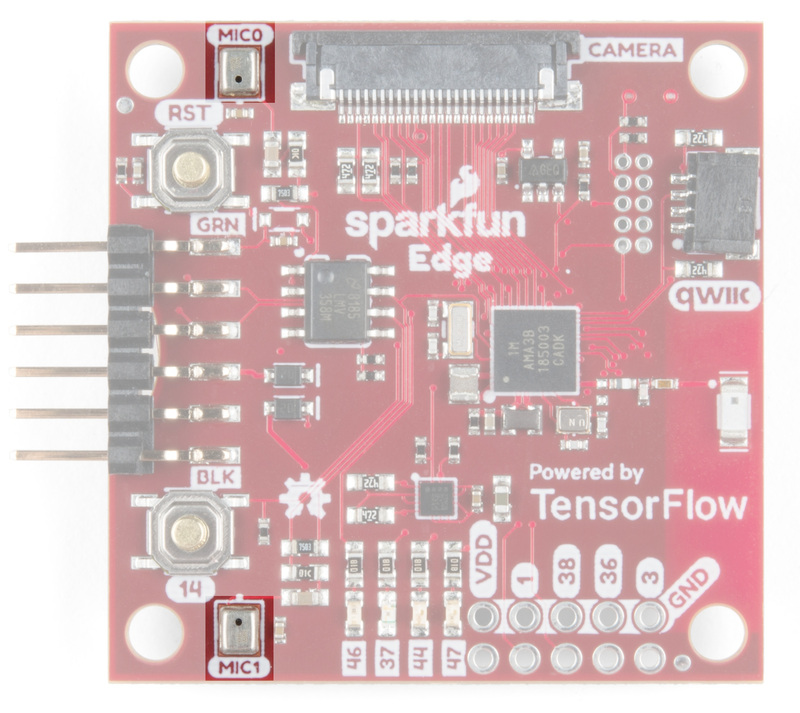 The pinout is compatible with SparkFun serial breakouts like the Serial Basic Breakout or the new Serial Basic Breakout with USB C. The ability to toggle the DTR line from USB is required for bootloading. ⚡ Warning! 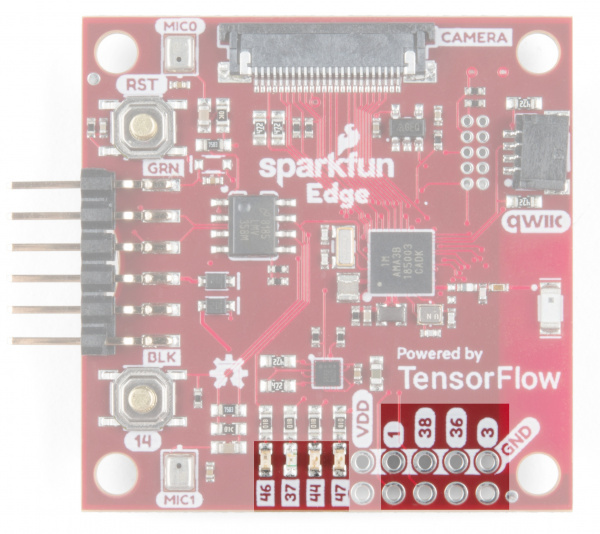 The Edge board has no onboard regulator to provide 3.3V and will be damaged if exposed to 5V. Make sure that your USB-serial bridge is set to output 3.3V power and logic. Check out the voltage selection jumper in the Serial Basic Hookup Guide. With your chosen method of connection at hand begin making the connections with care. If you have USB-serial bridge with the compatible pinout (order DTR, RXI, TXO, VCC, CTS, GND from the perspective of the bridge) you can simply make sure that the GRN and BLK labels match up between the bridge and the Edge board. 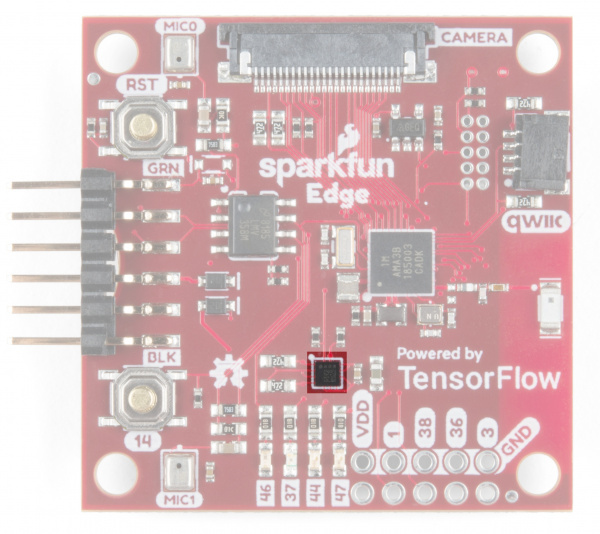 If you are using some other way to view/send UART data then make sure to connect the TX of the bridge to the RX of the Edge and vice-versa. Also make sure to connect GND (closest to the BLK label on the Edge) and DTR (closest to the GRN label) pins. From the bridge's perspective RXI is next to DTR and TXO is next to RXI. 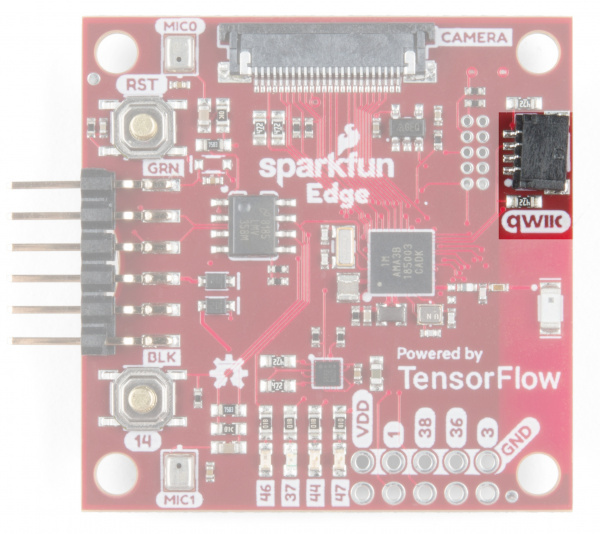 With the Edge board you can also add additional I2C sensors with the Qwiic connector and have access to four GPIO pins. Connecting Qwiic sensors is as simple as chaining them together with Qwiic Cables and then linking that chain to the Edge board. Note, if you have many sensors (5 or more is a good rule of thumb) then you'll need to disconnect the I2C pullup resistors from a few of the boards. ⚡ Warning! The GPIO of the Apollo3 are not 5V tolerant. To interface with a 5V sensor or controller use a bi-directional logic level converter. 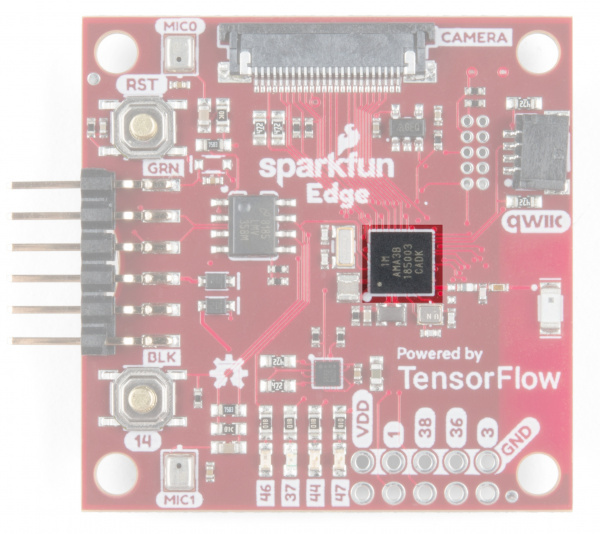 The Edge board takes advantage of the cutting-edge Apollo3 Blue microcontroller from Ambiq for incredibly high efficiency which allows AI applications to run on a coin cell power source. The cost of using the latest and greatest technology is that there is no Arduino support for the chip. In order to start developing your own applications you'll need to follow along with our extensive Ambiq Apollo3 Software Development Kit Setup Guide. Once your SDK is set up you should be able to compile and upload the examples. Here's a short description of each one. For more details make sure to follow along with the SDK setup guide. example2_dual_mic_dma shows how to use DMA to capture 16 kHz audio recordings from both microphones without blocking the processor. This is the basis of how audio is provided to the TensorFlow Lite demo. tensorflow_demo uses a pre-trained model to identify "yes" and "no" and blink a corresponding LED on the board. Using GPIO you could easily expand this example to control a device. SparkFun_Edge_Project_Template is an easy-to-use bare-bones makefile project that you can copy to any directory that you like. With only a little configuration you'll be writing your very own application! Need some inspiration for your next project? Check out some of these IoT tutorials!